As a linguist, artist, semiotician, and interdisciplinary scholar committed to social action, graduating senior Mary Atwood is a Notre Dame original. Drawing on seven weeks of research in Peru, the theology major recently completed a senior thesis that included English translations of three Inca legends gleaned from interviews with Quechua speakers in Cusco’s central market. The first part of her project provides written interpretations of the legends for English-speaking students. 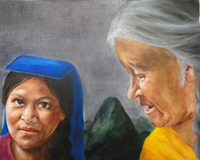 Atwood comments further on the stories with a series of original oil paintings intended to communicate visually—and more universally than language can—to both Quechua and English-speaking audiences. Someday, Atwood hopes to transform the work into a children’s book suitable for readers from both cultures. “The project allowed me to wear a lot of hats,” Atwood says. “It involved painting, linguistics, anthropological research, photography, and informal interviews. In the spring of 2010, Atwood began two semesters of Quechua language study in the College of Arts and Letters’ Department of Romance Languages and Literatures under the direction of Inés Callalli Villafuerte and Gina Maldonado, both visiting assistant professional specialists. With her interest piqued, Atwood signed up for more Quechua study in summer 2011 at the Centro Tinku language school in Cusco. There, the seeds of her senior thesis took root. After classes at the language school, Atwood would head down to the market and conduct interviews with Quechua-speaking residents about their cultural legends. “No, I don’t think I know any stories” was the standard first reply to her queries, Atwood says, but slowly, she earned their trust and they began sharing their traditional tales. 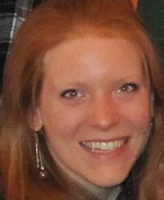 Atwood’s project was made possible, she says, with financial assistance from the Kellogg Institute for International Studies, the Undergraduate Research Opportunity Program in the College’s Institute for Scholarship in the Liberal Arts, and the Glynn Family Honors Program, a rigorous course of study blending the humanities and sciences. Available to some of the most promising scholars of each incoming class at Notre Dame, the Glynn program provides opportunities to work one-on-one with some of the University’s best scholar-teachers and guarantees students at least one summer’s funding to conduct original research. “Mary is a writer gifted with extraordinary powers of expression,” says her advisor Sabine G. MacCormack, Rev. Theodore Hesburgh C.S.C. Professor of Arts and Letters, and a faculty member of the College’s Departments of Classics and History as well as the Kellogg Institute. Like the celebrated Inca Trail that leads to Machu Picchu, Atwood’s path to Cusco had challenging twists and turns. A lover of languages since her high school Spanish classes and previous study abroad in Spain, the native of Woodstock, Conn., had planned a Japanese major around a junior year semester abroad in Nagoya, Japan. Then, in late 2010, she was diagnosed with thyroid cancer. Surgery restored Atwood to health, but discussions with her advisors and parents led to a decision that traveling so far from home so soon after her treatment might not be prudent. Atwood, who also has a keen interest in theology, looked at her credits and realized she was halfway to completing a major in that discipline. She finished her major in theology in a year and a half—and “absolutely loved it,” she says. Atwood’s transcripts will also reflect her minor in peace studies, and she’s just one literature course short of a second minor in Japanese. Studying such a wide variety of disciplines has revealed surprising connections, Atwood says. Many words are traded between Spanish and Quechua speakers, she notes. Atwood has also discovered similarities between Quechua and Japanese. “They’re syntactically similar, and there’s an incredibly strong linguistic link, which led to all sorts of comic mishaps whenever I unwittingly substituted a Quechua word for a Japanese one in class,” she says. Over the past two years, under the tutelage of Assistant Painting Professor Jason Lahr and of Michael P. Grace Professor of Painting Maria Tomasula, Atwood also learned how to paint. This summer, Atwood plans to continue refining paintings she created for her senior thesis. For the fall, she has secured a paid internship at Notre Dame working as a liaison between the Office of Campus Ministry and the residence hall choirs. “I’ll also work with Notre Dame Folk Choir members as a spiritual mentor,” Atwood says, noting that she is considering ministry after that or possibly entering graduate school in theology, peace studies, or anthropology. No matter what she decides, Atwood says the connections and personal friendships she forged at the Cusco market will linger. In a passage from her senior thesis, she recalls a conversation that occurred during her research there. Originally published by Mark Shuman at al.nd.edu on May 22, 2012.